Gillian Duffy, the voter Prime Minister Gordon Brown called a "bigoted woman", says she and her family have been lifelong Labour supporters. The 65-year-old is a widow whose husband died of cancer four years ago. She worked for Rochdale council for 30 years, describing herself as working with children and disabled children. Mrs Duffy, a pensioner from Rochdale, who has a daughter and two grandchildren, said she was an "ordinary woman". Among the topics she confronted Mr Brown about was immigration, complaining about the number of people from Eastern Europe now living in the UK. It was this question the prime minister later admitted in an interview on BBC Radio 2 he thought was "annoying". Mrs Duffy also complained about people on benefits. "There are too many who aren't vulnerable and they can claim, and people who are vulnerable can't get claims - can't get it," she said. Mrs Duffy told the prime minister her father had even sung the traditional socialist song "The Red Flag" when he was a teenager. Before adding that "now I'm absolutely ashamed of saying I'm Labour". She also told the prime minister the three main things "I had drummed in when I was a child was education, health service and looking after people who are vulnerable". Speaking about her two grandchildren, aged 12 and 10, she said she was concerned about how they would be able to afford to go to university when they are older. During their conversation, Mr Brown told Mrs Duffy "you're a very good woman, you've served your community all your life". This was at odds with his comments, caught on microphone in the car after their meeting, where he described her as "bigoted". 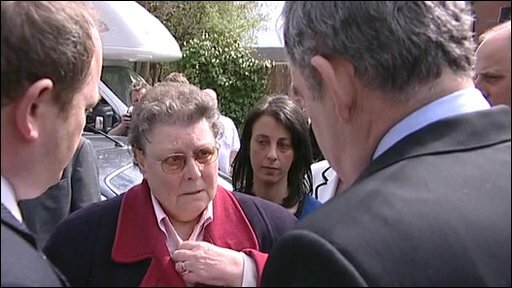 Mr Brown subsequently visited Mrs Duffy at her home in Rochdale to apologise in person. Upon leaving after 45 minutes, he told waiting reporters: "I have given her my sincere apologies." Mrs Duffy herself has yet to comment following the visit.